Central and Magenta will meet for just the second time tomorrow. An exciting encounter awaits fans on Sunday when AS Central Sport welcome their New Caledonian cousins AS Magenta to Stade Pater to battle for the final berth in the 2019 OFC Champions League semi-finals. Tahiti is a hive of activity with the opening ceremony of the annual Festival des Iles scheduled for Monday evening. With group play already underway, the OFC Champions League Quarter Final will be another highlight on a full calendar for local fans. Having dominated their group in Fiji, Central Sport returned home to the Ligue 1 where they’ve experienced mixed results, including two recent losses to AS Tefana and AS Pirae. Magenta meanwhile can count just one Super Ligue match under their belts since qualifying second from their group behind Auckland City, with the New Caledonia national league getting underway just last week. Not exactly ideal preparation or results for either side, however with a place in the semi-finals on the line both are rearing to go in a match that will almost certainly offer plenty of entertainment for those fortunate to fill the stands at Stade Pater. These two sides last met in 2017 in Noumea, New Caledonia during the Group Stage of the Champions League. Central were denied passage to the semi-finals on that occasion in what proved to be a fiery encounter. The match ended 4-2 with both sides losing a player in the 90th minute to red cards – now captain of Central Fred Tissot, and Kevin Maitran for Magenta. The pressure is on for both teams. Central coach Efrain Araneda is hoping his side has overcome the issues they’re having with concentration which has seen them lose their last two matches. 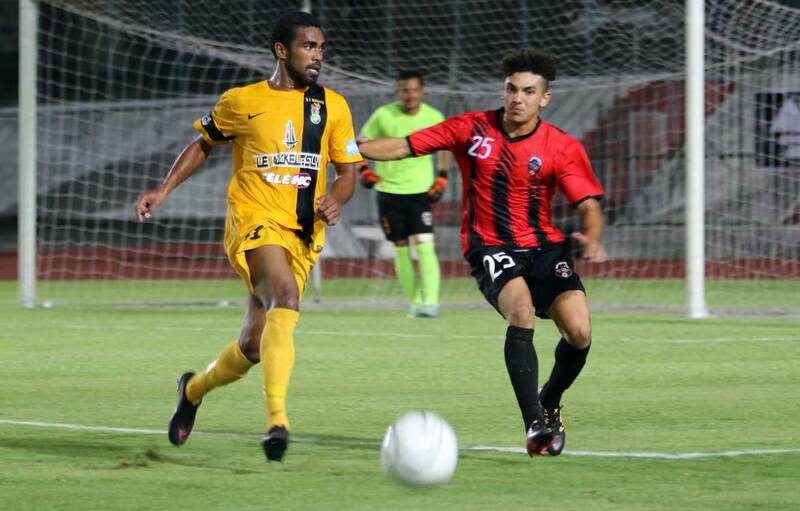 “We conceded the a goal in the second minute of the first half, and the second minute of the second half,” Araneda said of Central’s Ligue 1 match against Tefana last weekend. Although Araneda would have preferred to be going into tomorrow’s clash with the confidence of a winning run behind them, he believes his team have the potential to get the job done. “It’s complicated because of course it’s better to go into a big match with the confidence of having won in the championship, but we have to make do with what we’ve got. Anything is possible. “We’ll hold onto our positive state of mind, and our desire to push forward. We need to work on a couple of things of course. But we have the potential to play a semi-final at home so we need to keep going. Magenta coach Alain Moizan was in charge when the two sides last met at Numa Daly two years ago and believes he has a good idea of how their opponent will approach the match tomorrow. However he’s more interested in his players and how they will manage the pressure of trying to get a crucial win away. “We have to win this match, absolutely, we have to. I’m not looking to closely at the vision of our adversary, we’ll concentrate on playing to our strengths, and imposing our game plan,” Moizan said. “I would say that the strengths of my side is that we play a classic New Caledonian style with a certain level of aggressiveness and a desire to score goals. Vital Statistics: Central has never made it to the semi-finals of the OFC Champions League. The Players: The side has lost two players from their squad of 23 after Diego Araneda and goalkeeper Christian Tepau were called up for the U-20 Tahiti national team which is currently in Paraguay for a friendly. They’ve been replaced by Jonathan Tehau and Teheivarii Ludivion. Vital Statistics: Magenta remains the best-performing club from New Caledonia in the OFC Champions League and will want to hold onto that title by following Hienghene Sport into the semi-finals. The Players: Attacker Emile Ounei has been on-form for the side this year and coach Alain Moizan counts him among one of his most promising young attackers.